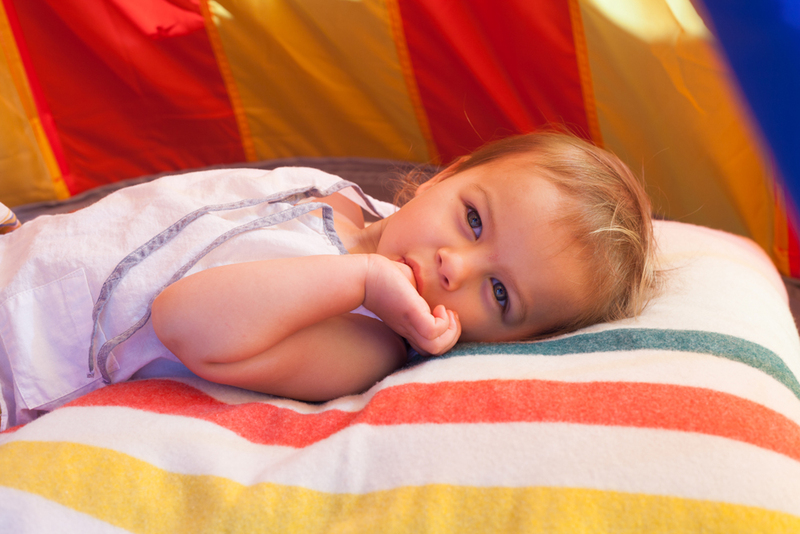 Going from one child to two can often be a dizzying experience. 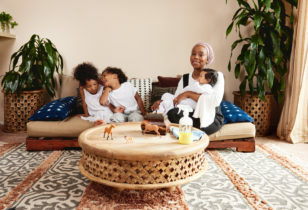 But Lawren Howell, a freelance fashion editor for Vogue, who has worked with everyone from Kate Bosworth to the cast of Girls, made the transition look simple when we visited her Venice Beach abode. With her 4-week-old son cradled in her arms and her 2-year-old daughter showcasing that signature toddler energy, Howell (the woman who inspired Jennifer Antison’s signature “Rachel” haircut, btw!) let us capture her in all of her new-mom glory. 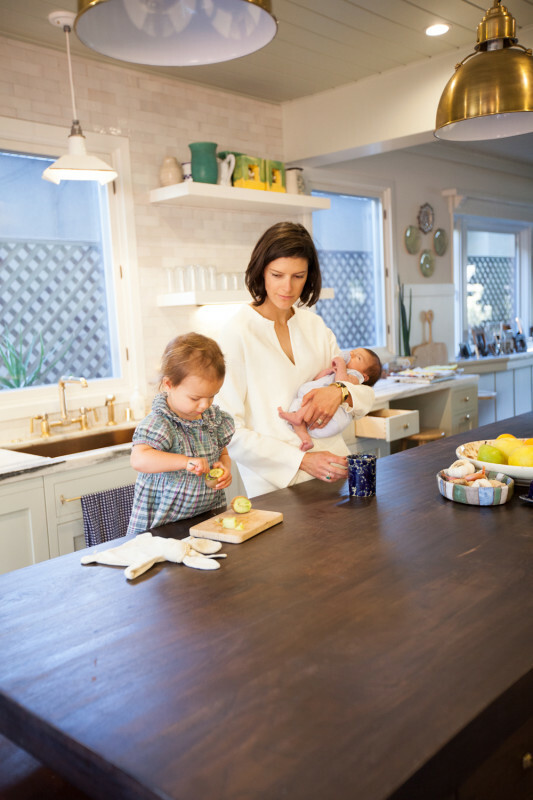 Take a look at her chic and kid-friendly crib, plus hear about Howell’s distinct motherhood POV, right here. 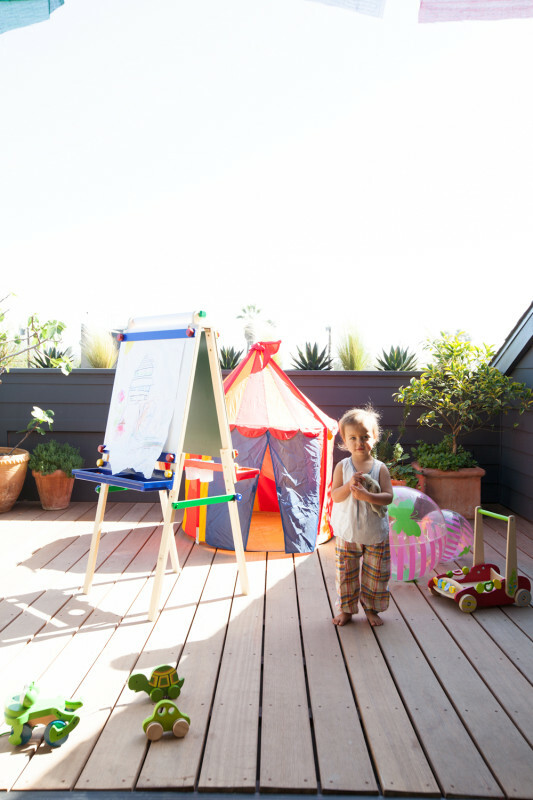 "Our deck is an extension of our playroom. We like to go up there to watch the sunset and do some painting." Lawren wears a Jasmin Shokrian t-shirt, Acne jeans, Alaia sandals, and Cartier watch. Her daughter wears Pink Chicken pants and a Neige tank. 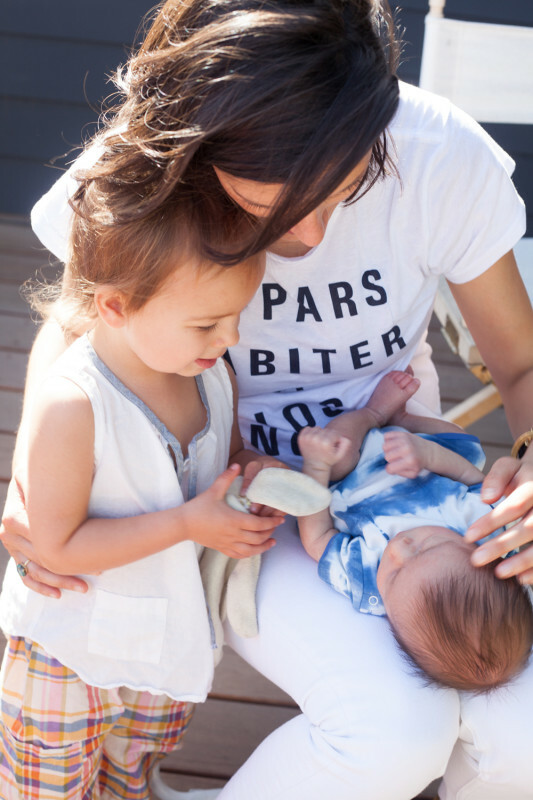 Her son wears a Tane Organics onesie. "Life has changed in every possible way! What I love about having children is that you start to see the world through the eyes of a young child and everything seems exciting and new again. Something as mundane as going to the carwash becomes a total adventure with a toddler, and things like parades and kites become exciting again. 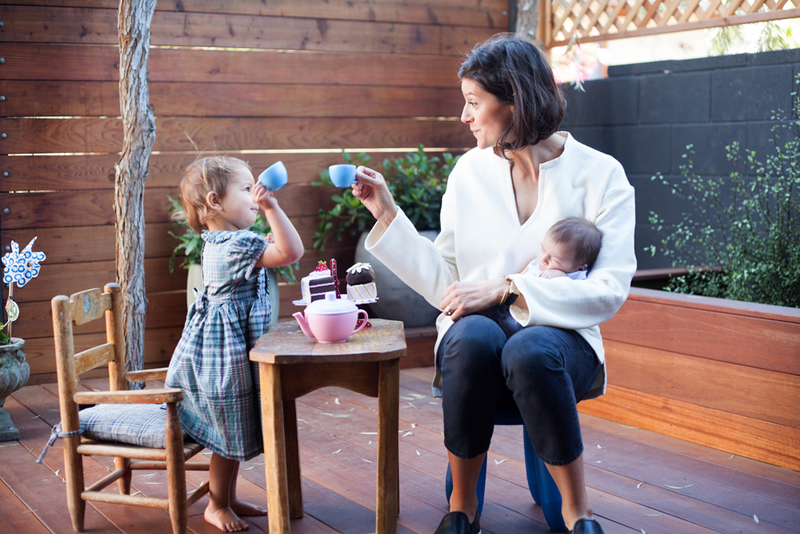 You and your partner really become even more of a team when you have a newborn and a two-year-old!" "Observing my daughter's curiosity and the progression of her vocabulary. 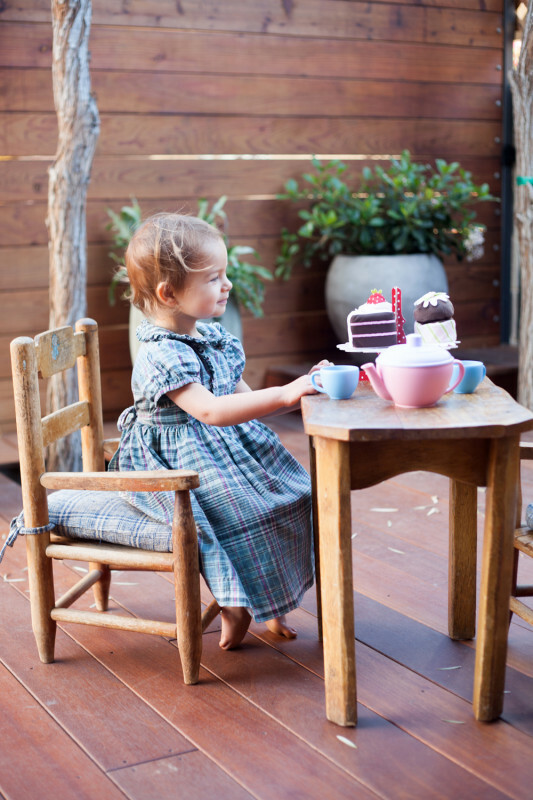 The words she picks up from us and her early first sentences are precious." 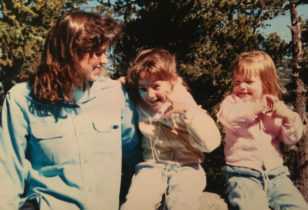 "I love hearing my daughter call me mama, because sometimes I still can't believe I'm a mom." 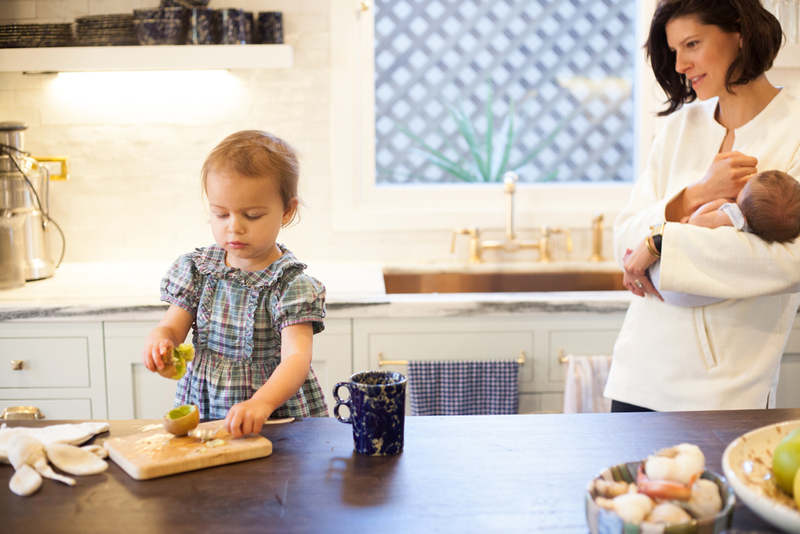 "Our kitchen, as with most families, is where we spend most of our time. That, and the dining/play area. 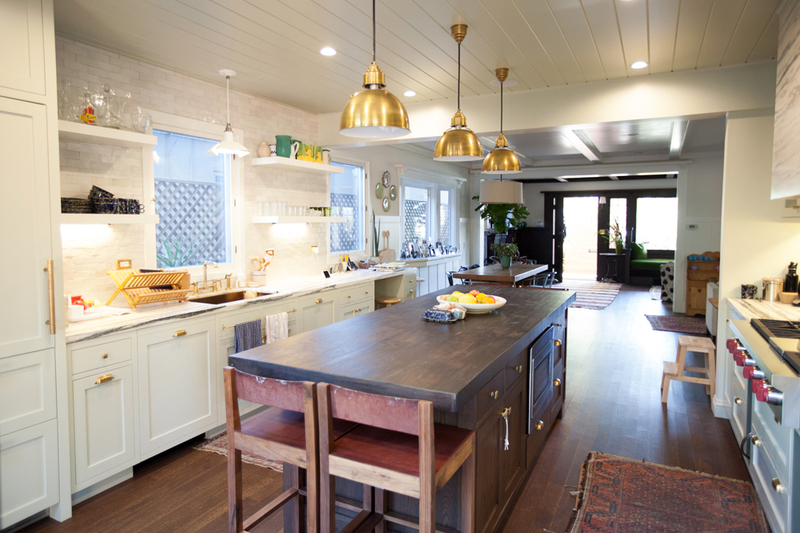 I love the color and the open layout of the kitchen. It's where I go to procrastinate and start a cooking project when I should be doing office work! We wanted it to be open with lots of counterspace and workspace, making it a place to eat and comfortably gather." "My husband made our dining room table for me as a gift. He is not a woodworker, so we are all very proud of it. And I love the headboard in our bedroom. My parents had an old one in storage that was covered in chintz from the '80s, so I had it recovered in a thick linen in one of my sister Stevie Howell's fabrics." Lawren wears a Baja tunic, Crippen jeans, and Common Projects slip-on sneakers. 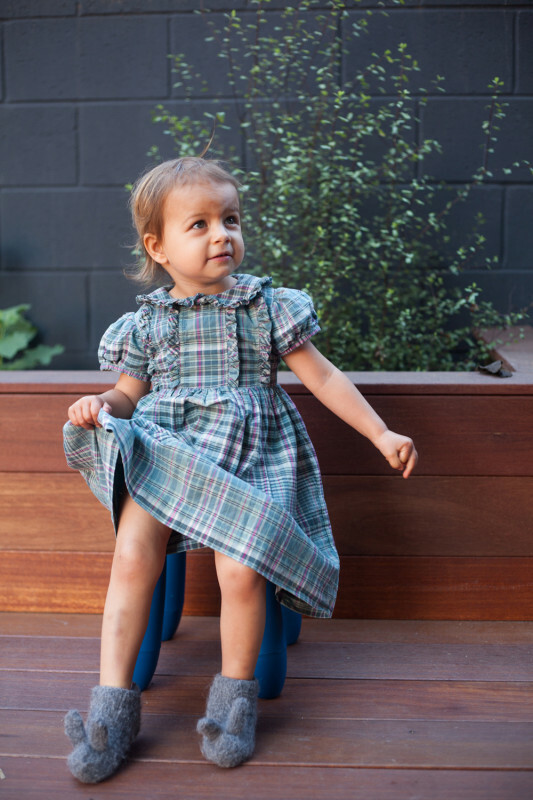 Her daughter wears a Rachel Riley dress and Oui Press bunny slippers. Her son wears a seersucker onesie by Petit Bateau. "Opposites attract, like texture and shine. 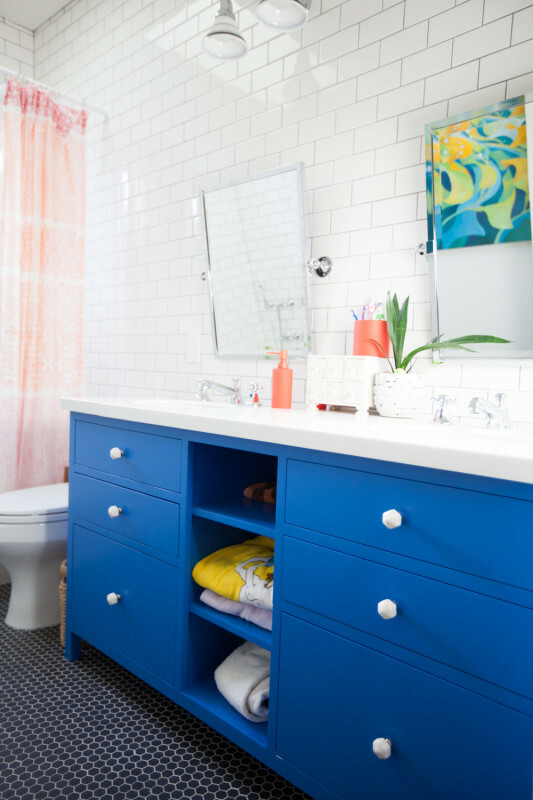 Choose a color story for each room. And do not make any room too precious!" "My level of patience. And, it may sound corny, but it's surprising how much love you have for them." "I'm never able to describe my aesthetic. The moment I try to define my style, I feel pigeonholed. Hopefully from the outside it seems more consistent, but to me it feels like a total hodgepodge! I will say that I'm attracted to old houses, old things, and masculine things, like dark wood rooms, leather furniture, and brass hardware. But, I also like pops of color. I like nautical things and earthy things, but I also like a little polish, like a silver tea set." 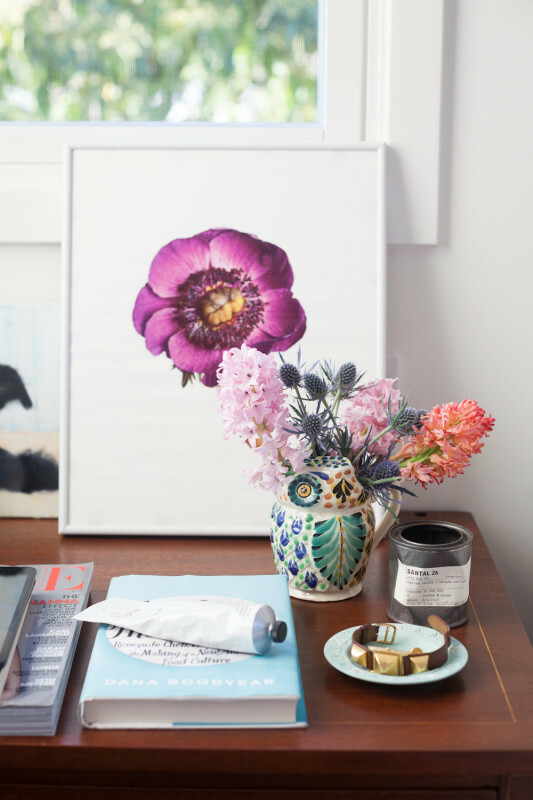 "I can say that my aesthetic priorities have changed after having kids, where comfort and livability are paramount. 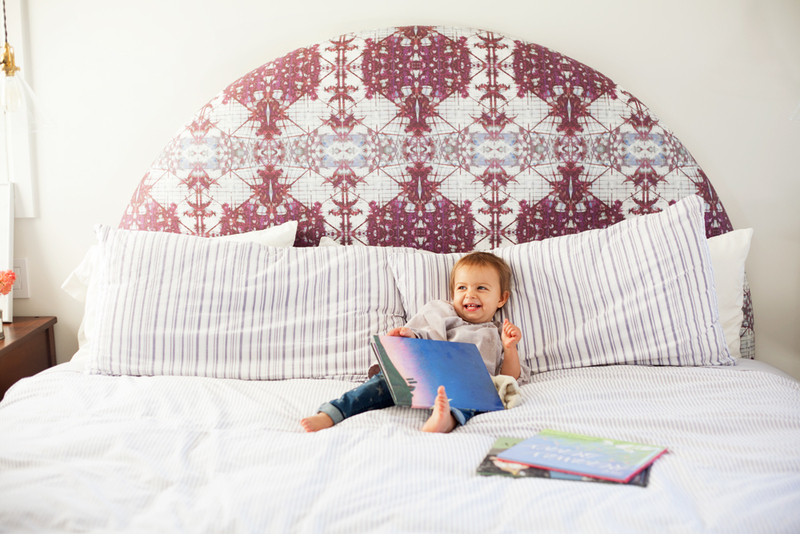 For example, we choose a thick pile Moroccan rug for our living room over a rough, flat weave, since we spend time sitting on the floor with babies." 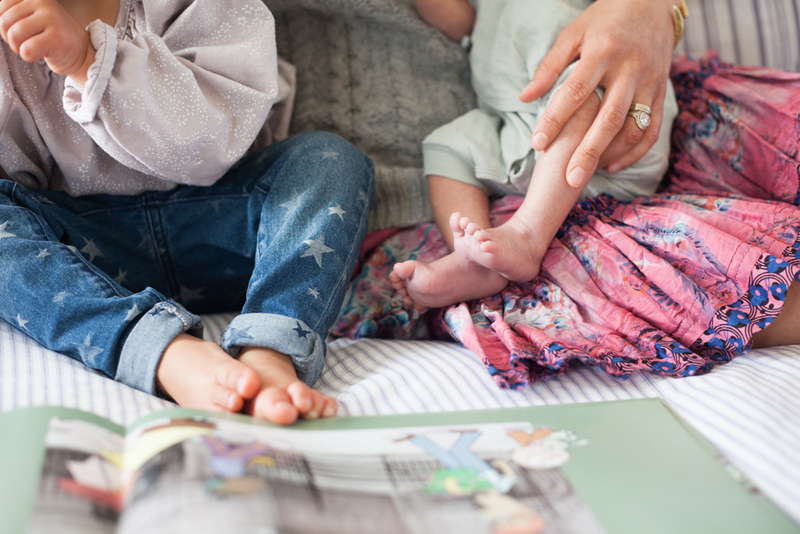 "I read Rip+Tan, my friend Jenni Kayne's blog about motherhood. 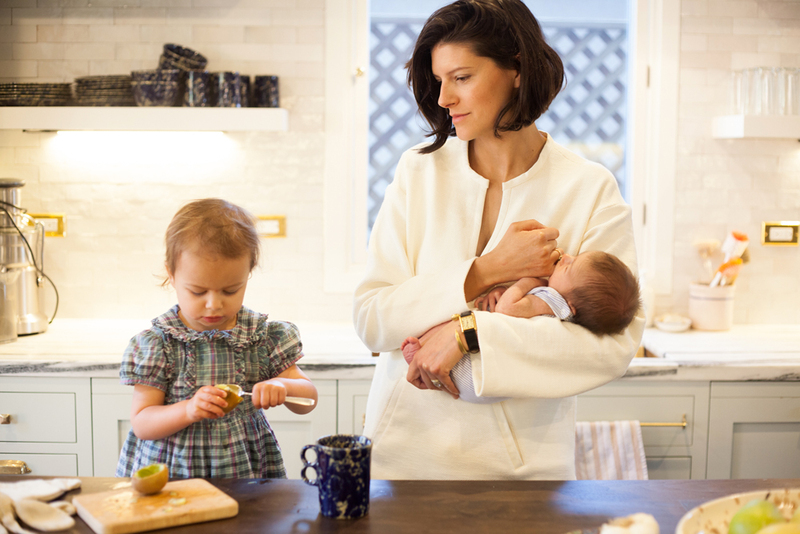 Also, my friend Zoe Schaffer's blog, Macaroon Original, Goop, and now Mother!" 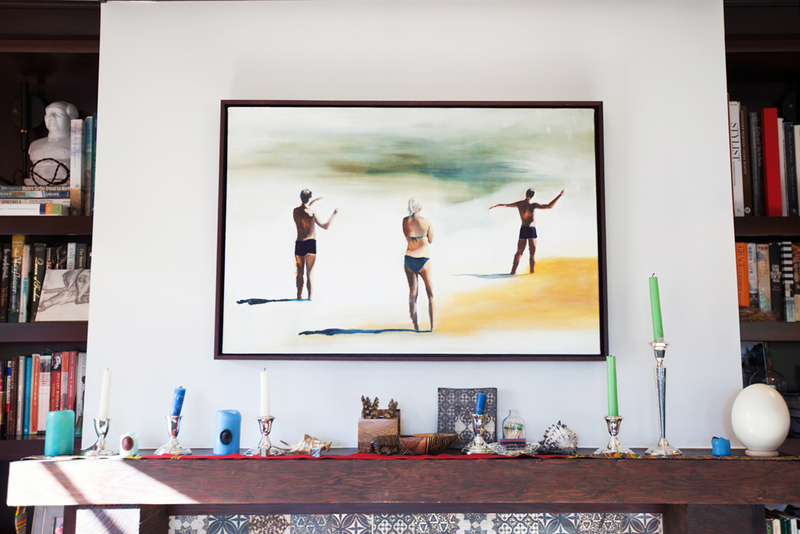 The painting, The Bathers, is by Stevie Howell. The fireplace tiles are from CLE Tiles. "Pancakes and a walk to the farmer's market. Meet with friends there, then stroll back home, stopping at the beach park. Family nap time and afternoon playtime or reading. Meet friends at a delicious dinner at a neighborhood restaurant. Bathing the kids and putting them to bed. Catching an episode of The Daily Show. Reading a few pages of whatever book is on my nightstand. And be in bed by 10 p.m."
"I think the mom friends I surround myself with are my mom icons. I take little inspiration from each one of them. I'm lucky that I have a real variety of mom friends to compare notes with; some with full-time careers, and others who've left their careers to be full-time moms. It's so nice to get a range of perspectives." "I pretty much shop 75-percent online now, because who has time to shop? Although, if it's a special boutique or we're traveling, I will not miss an opportunity to shop in-store." "My personal style is about comfort, classics, a little luxury, and not allowing the clothes to speak too loudly. I tend to dress in a tailored way with a slant towards menswear. When I dress up, I gravitate towards the minimalistic or architectural side. My style is not very bohemian, though I love wearing my Gregory Parkinson print dresses when on vacation or at the beach! My style now revolves around being comfortable, which works great as a mom of two very young ones! Luckily we are on trend with flats/sneakers/Birkenstocks at the moment." "Birkenstocks for myself, Saltwater Sandals for both kiddos, kids desert boots by Pepe (sold at Jenni Kayne's Montecito store), a Tamar Morgendorf wood-grain owl mobile for over my son's crib, a Petit Bateau swimsuit for my daughter, and, again for me, a pair of Simon Miller cropped moto jeans from the newly launched women's line." 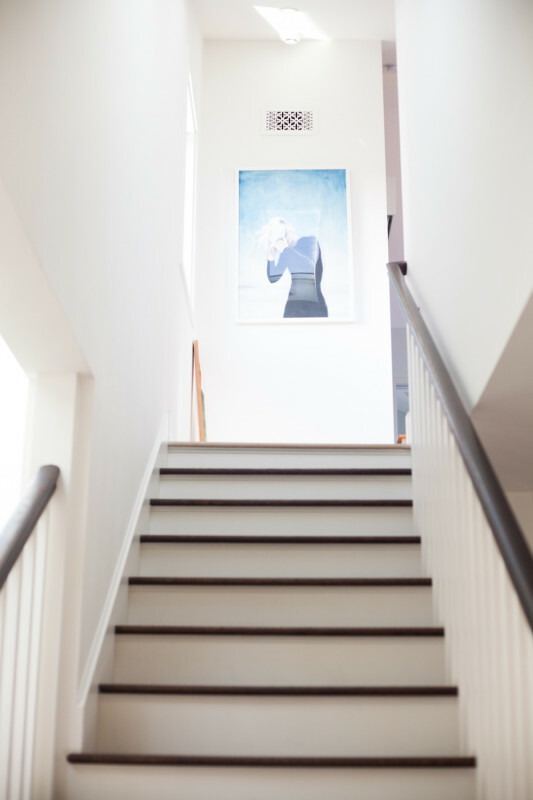 A Stevie Howell painting hangs in the stairwell. "It's sort of jungle themed. I liked the print my sister made called 'Weeds,' so we had it made into wallpaper and it makes the room feel a bit like a rainforest. 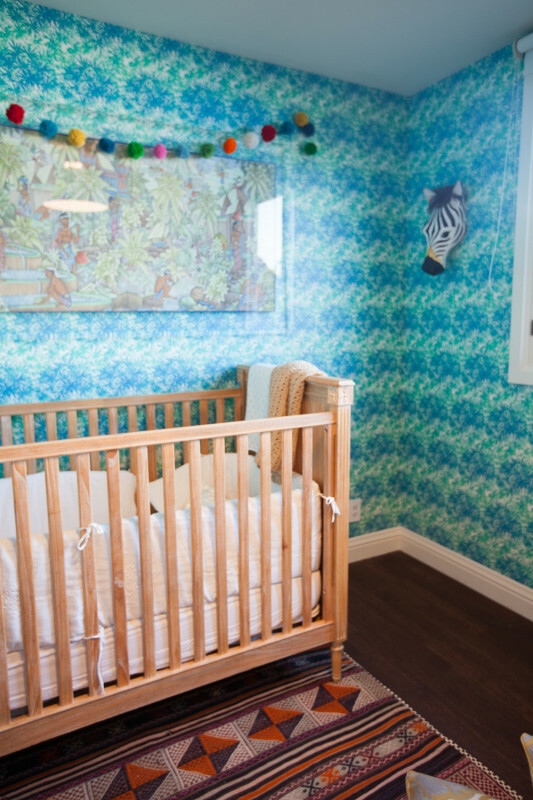 We wanted the room to feel a little transportive and magical." Lawren's daughter wears Joe's Jeans and an Eco Serene tunic. "A small rocking chair, which was my grandmother's, and the vintage children's desk that my husband found at a thrift shop." "Sacai, Crippen, Gregory Parkinson, Rodarte, Band of Outsiders, Juan Carlos Obando, The Row, Celine, Jenni Kayne, Chloé, Stella McCartney, Yohji Yamamoto, and Dosa." Lawren wears a Lili Lotan sweater, Gregory Parkinson skirt, Cartier watch, and Giles & Brother rail spike cuff. "Newbark slippers, Golden Goose sneakers, Junya Watanabe jeans, Crippen tees, Common Project sneakers, my Proenza Schouler moto jacket, Acne white jeans, The Row cashmere sweaters, an Irene Neuwirth locket and opal ring, Patagonia long underwear worn as leggings, and vintage French Navy striped shirts." "Yet again, it was designed by my sister, Stevie. I wouldn't know what to do if my sister wasn't an artist!" "I find it to be almost like New York in that you have almost everything needed within walking distance. I love the sense of community that we have. In Venice you get to know your neighbors and interact with them frequently. I could live in a lot of different places, mostly all cities: New York, San Francisco, London, Paris. But I fantasize about living in the country—Ojai or parts of Northern California like West Marin or Sonoma." "I've worked for 12 years at Vogue starting out as an assistant on staff and now as a contributor. I think moving to California from New York has really defined my work. It's influenced my taste and focused my work. Styling shoots for Vogue introduces you to some of the world's most interesting characters, whether they are actors, writers, politicians, photographers, or executives. You always meet people who are at the top of their industry and there's always something to learn from them. I love that. Also, working with designers and watching their ideas unfold on the runway is fascinating." 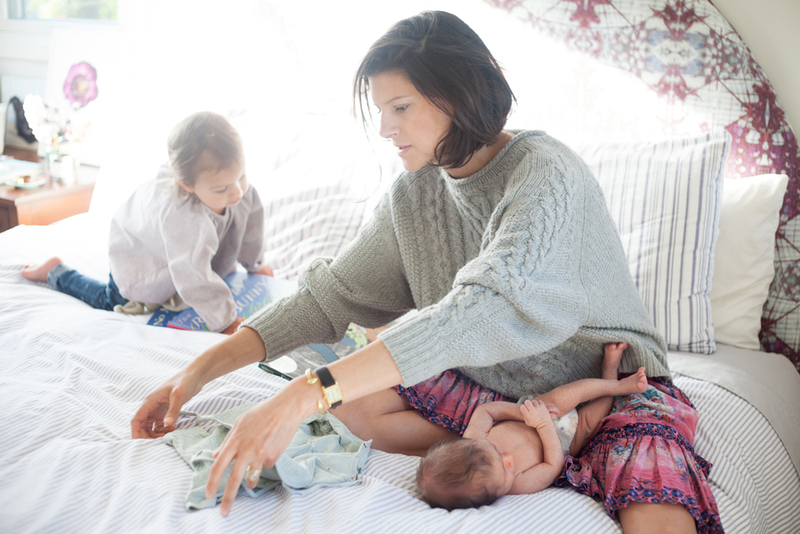 "I feel that work and motherhood have forced me to be more organized, more pragmatic, and more decisive and effective. That balance has really made me grow as a person, and I think each has helped the other out." 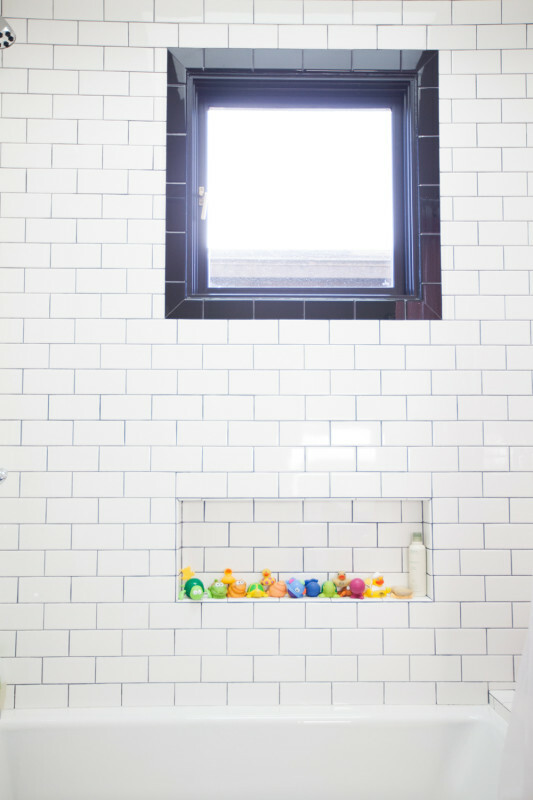 "This was an old bathtub that was not being used by my husband's parents. 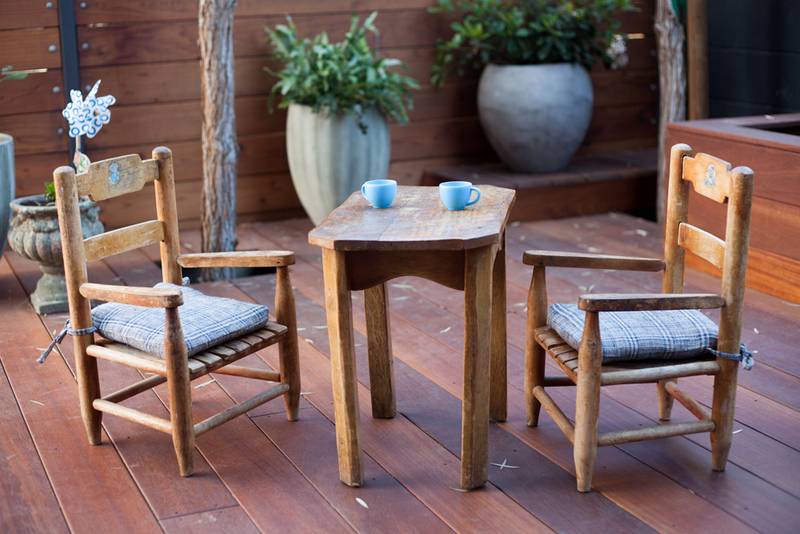 It was all scratched in storage, so we had it refinished." "They are actually borrowed from my parents, who had them in our house growing up. 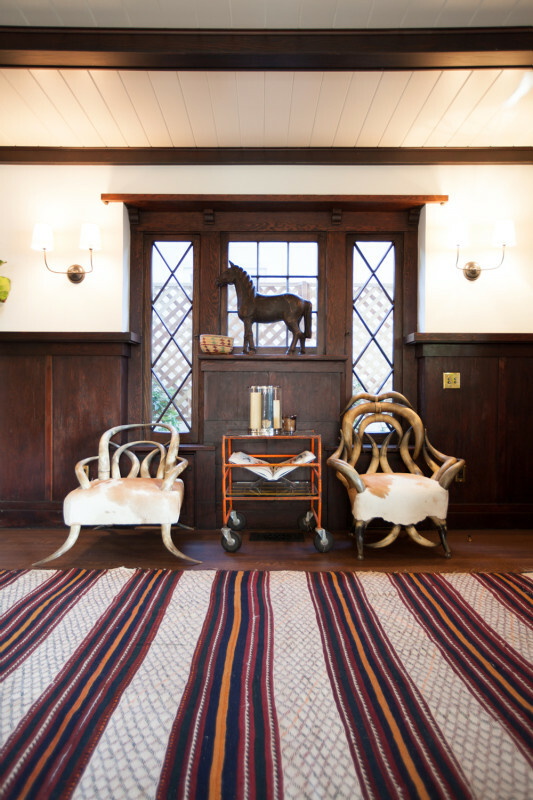 They are from a French antiques dealer despite their Wild West appearance." "The Helmet Newton book was a birthday gift from a good friend. I never had a place to display it, so it's sort of discretely on show in this glass cart that came from an old Levi's factory in S.F." 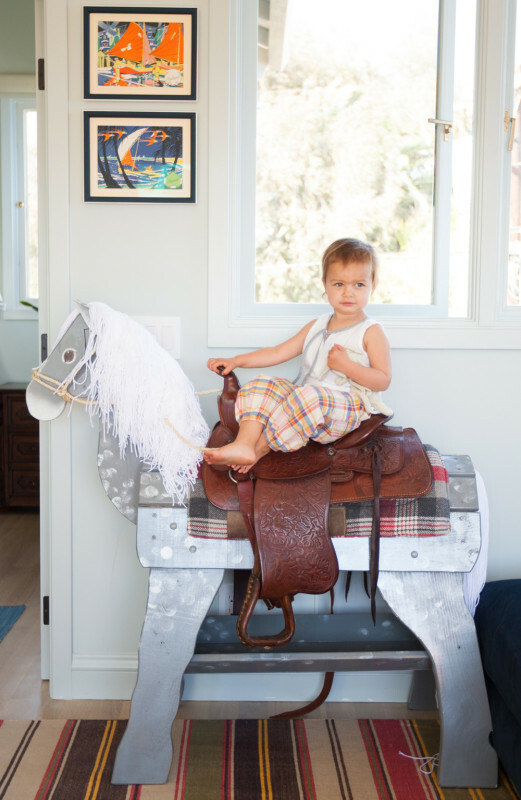 "The wooden horse came from an antique store in Sonoma. 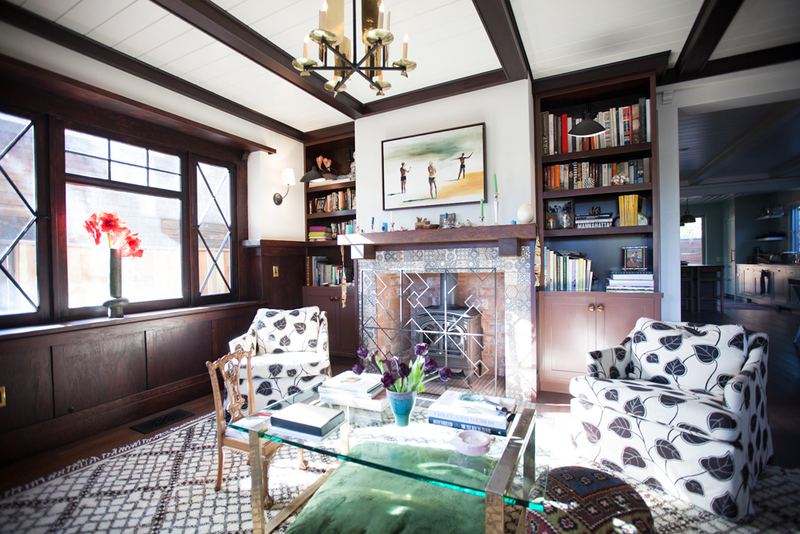 It's in the kids playroom, which doubles as a place to watch movies." "Travel, go to movies, go out to eat, and then don't complain about missing any of it when you have your baby." "I never did baby groups when my daughter was really young, but I have a great group of mom friends from the neighborhood who get together for a weekly playgroup. That playgroup has been so helpful and fun. We socialize, compare notes on our kids, and share everything from favorite recipes to activities. What I love, too, is getting to know kids other than my own. I think that's a rare opportunity in our modern world to be able to watch a child grow that's not your relative!" 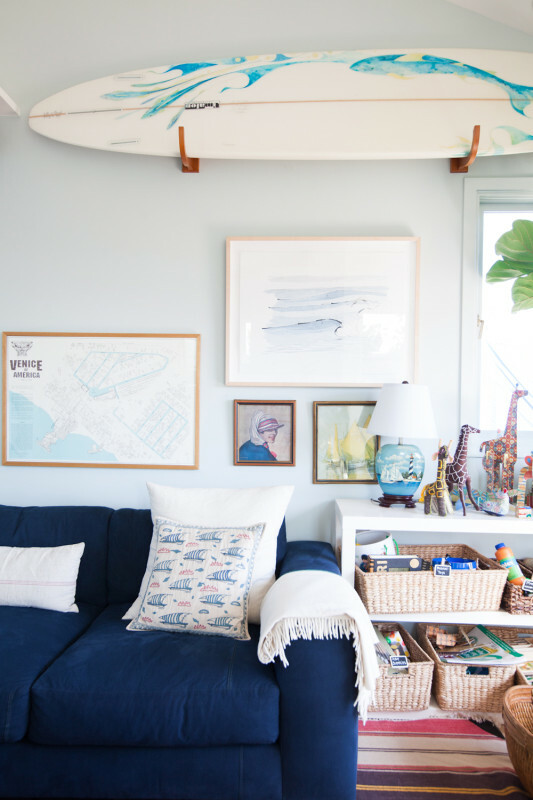 For more on Lawren Howell and to read her guide to Venice Beach, CA, head over to our Travel section.